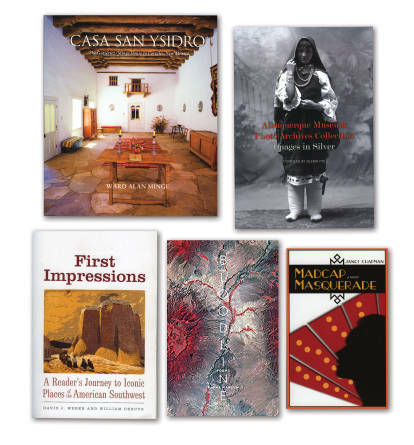 To commemorate its 50th anniversary in 2017, the Albuquerque Museum commissioned a series of books documenting its rich collections. If these first two are any indication, admirers will want to collect all four. The first, Casa San Ysidro, offers the kind of experience many visitors wish they could have when visiting the Territorial home turned museum: Linger as long as you like, ogle the architectural details, check out the art and furnishings. Narration from historian Ward Alan Minge accompanies the full-color images.Along with his wife, Shirley, Minge bought the 19th-century hacienda in the early 1950s, then spent decades restoring and rebuilding it. The pictures of rough-hewn vigas, lustrous plaster, and covetable textiles will lure you in; Minge’s passion for collection and preservation makes the book hard to put down. In 1996, the couple donated the house and its contents to the museum, which opens for tours March through October (nmmag.us/casavisit). Second out of the gate, museum photo archivist Glen Fye shouldered the ordeal of culling just 180 images from a bounty of more than 130,000. Getting lost in the treasures of the Cobb Studio Collection alone would challenge a person, with rabbit holes that include 1880s street scenes, early trains, and an array of portraits revealing Albuquerque’s multicultural diversity. Other images in Albuquerque Museum Photo Archives Collections spotlight early aviators, diners, banks, baseball teams, and the sadly demolished Franciscan Hotel. Other than captions and a few brief essays, Fye lets these black-and-white photographs do the talking. Veteran travelers of the Southwest have likely explored Acoma Pueblo, El Morro National Monument, Carlsbad Caverns, and Chaco Canyon and, in doing so, traced the footsteps of millions of previous tourists, explorers, and settlers. What might they have seen had they joined the earliest nonindigenous visitors? Renowned historian David J. Weber made that question the focus of First Impressions, beginning the book before his death, after which the task fell to Governor’s Arts Award winner William deBuys (see “The Good Neighbor,” October 2017, nmmag.us/WilliamdeBuys). There are moments of unquestionable beauty in Radha Marcum’s collection of poems, Bloodline. That it is often beauty tinged with sadness, and on occasion shame, makes it all the more powerful. An exploration of her grandfather’s legacy as a progenitor of the first atomic bomb, the book resonates with the aftershocks—emotional, physical, and psychological—that continue, both across the generations of her family and over the timeless lands of the Pajarito Plateau. It’s a personal exploration and one with high stakes. In “A Theory of Relativity,” she wonders, “how will atomic history pull / on the rest of history? / Your children’s children’s children? / My children.” Most of the poems endeavor to answer that question, in terms that are both distinct and universal. But they also try to unearth the indistinct artifacts of the secret city and her grandfather’s relationship with it and its mission: the long-lived echoes of Oppenheimer’s dog; the ravages of time on buildings, on people, on dreams; the resilience of nature in the midst of destruction; and the impact—figuratively and literally—on people around the world. Set in the artist-colony heyday of 1920s Santa Fe, Madcap Masquerade delivers a yummy trifle of a tale based on Shakespeare’s As You Like It. Misbegotten romances and cross-dressing lovers hang out with real-life notables, including poet Witter Bynner. The action takes place during Santa Fe Fiesta, just when Anglo artists were kicking up the Reconquest remembrances by inventing now beloved events like the burning of Zozobra.